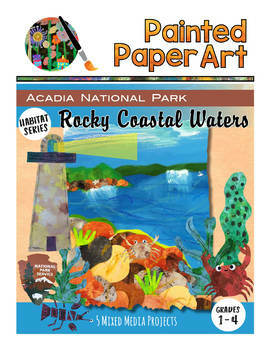 The second in our Habitat series, Habitats: Rocky Coastal Waters - Acadia National Park is now available. This unit contains information specific to the habitat of the rocky coastal waters and connects fun art lessons and science together while bringing Acadia National Park to your classroom. Acadia is a beautiful national park located in the state of Maine along the Atlantic Ocean. It is a destination your students will love to learn about while gaining an understanding of the rocky coastal habitat. These art lessons are easy to follow while being successful and fun for students.These lessons cover grades 1-4, but any age will love creating these projects. Each project requires 1-2, 40-minute art sessions depending on grade level. Hi, I’m Laura Lohmann and I have been teaching Art for 20 years in Ohio. I love teaching students fun and exciting projects and hope that you will find my projects enjoyable for your students. I enjoy seeing my students start with a blank canvas and explore using art materials to create beautiful masterpieces. Thanks for stopping by and for letting Painted Paper Art be your top destination for art lessons.